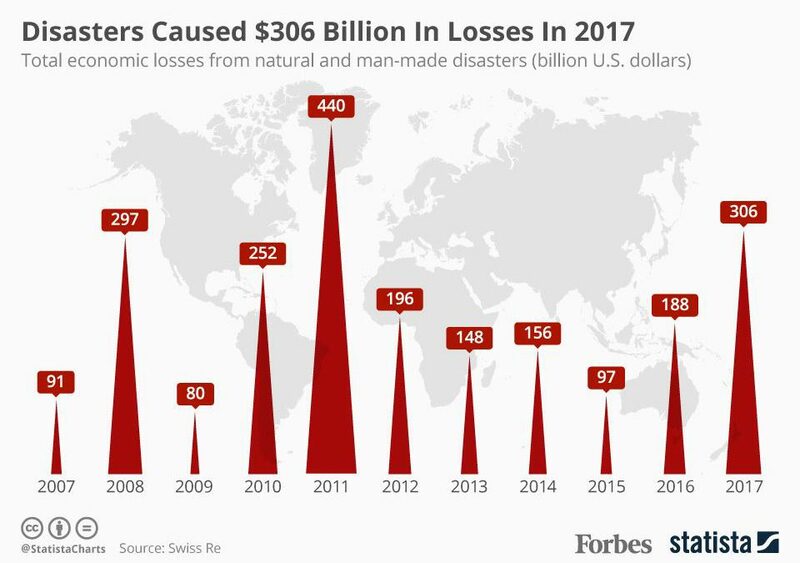 2017 ended the year with approximately $306 Billion in catastrophic losses as a result of global disasters. The insured portion of these global losses is projected to land somewhere north of $135 Billion, making 2017 one of the three most costly years in recorded history. Okay, take a breath. In the next few paragraphs, we will breakdown what this may mean for Commercial Lines Policyholders. The effects of catastrophic (CAT) losses in 2017 will put rate pressure on the marketplace. Sluggish premium growth, large underwriting losses, and depressed investment earnings are adversely affecting carrier balance sheets. While the industry is still considered STABLE, surplus and capacity lost in 2017 will drive the need for greater rate adequacy in 2018. Low interest rates, claim frequency in key lines such as Property & Auto, and mounting global geo-political risks will result in a rationalization of prices for most commercial policyholders. Property: Moderate increase expected as a result of an estimated $100 Billion or more in 2017 losses. Auto: Expected to increase anywhere between 3-8% for non-loss affected accounts, 10-20% for moderate loss affected accounts, and 20-25% for high loss affected accounts. Distracted driving and increasing repair costs are driving rate. General Liability: Rates are expected to remain flat to a moderate increase as pressure from catastrophe losses spills into other lines. Workers’ Compensation: Underwriting profitability, improved claims management, and declines in average lost-time frequency are all positive indicators that rates should remain stable. Management liability: Coverages such as Director’s and Officers, Fiduciary Liability, and Employment Practices insurance are expected to experience increase across most accounts as a result of rising claims frequency. Cyber liability: Despite a string of high-profile breaches, renewal increase are not expected to break the single digits. Specialty Lines: Pricing for Professional liability, Excess insurance, Terrorism and Marine coverage are expected to remain level to a moderate increase. Please don’t shoot the messenger or adviser in our case. The outlook for 2018 is not going to be as dramatic as what you might expect from a year when the industry shells out $135 Billion. Market conditions have been some of the best in recent history for insurance consumers. Stability in the marketplace is measured by the industry’s ability to produce a strong balance sheet. As your adviser, it is important for us to have a pulse on the market and to share it with you. Pricing increases are subjective and underwriting will make concessions for accounts that are committed to reducing their Total Cost of Risk. Take this opportunity in the New Year to RENEW your commitments to safety, wellness, compliance, risk transfer, claims management, and loss control. When we do these things together, the conversation about your RENEWAL is a whole lot less frightening.